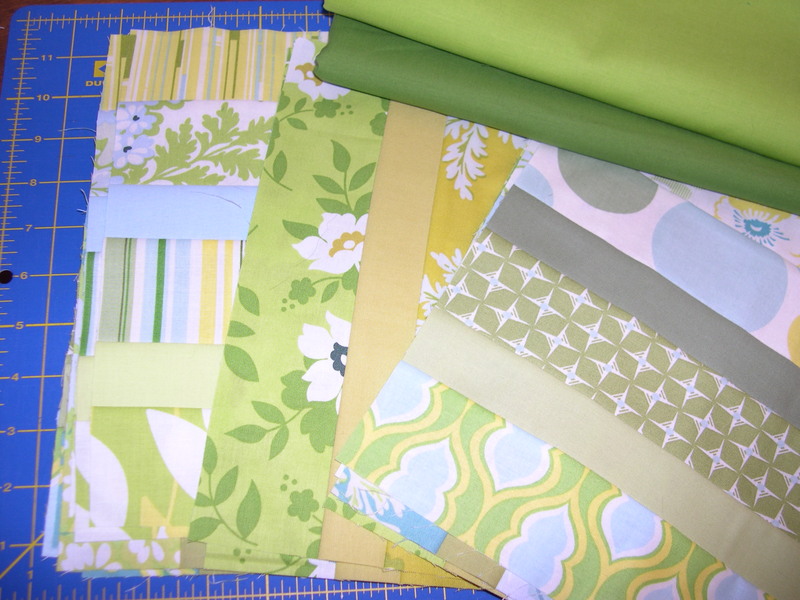 I bought these Nicey Jane fabrics with the idea of making placemats or a table runner to brighten up our kitchen table for spring. I started piecing them together a month ago, and I finally had time to finish the ensemble. 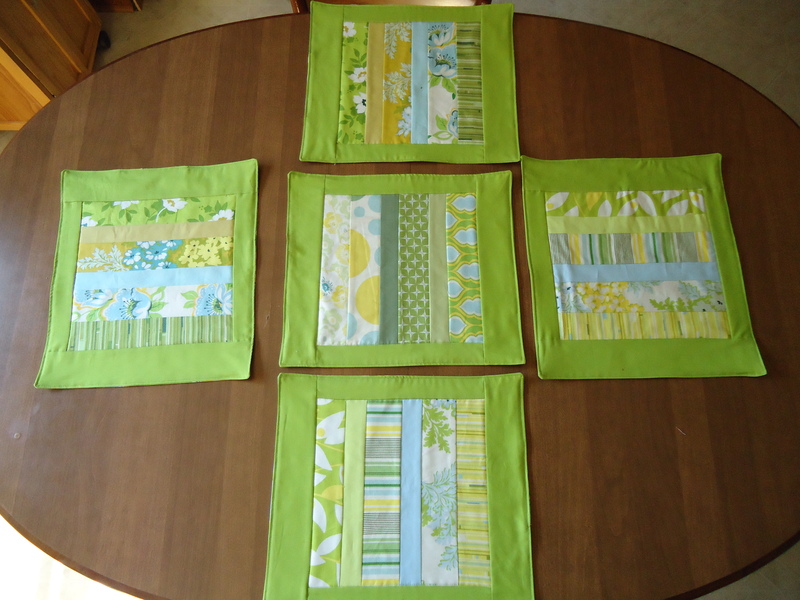 I made the placemats first by sewing together four printed strips and a couple uneven solid strips, which measured 10.5 inches wide. I cut those strip sets into 10.5-inch squares, and framed them with chartreuse green solid borders. I didn’t feel like sewing bindings onto each individual placemat, so I layered them right sides together with a piece of flannel for batting, sewed them together, leaving an opening to turn them right side out, and quilted in the ditch to secure the layers. 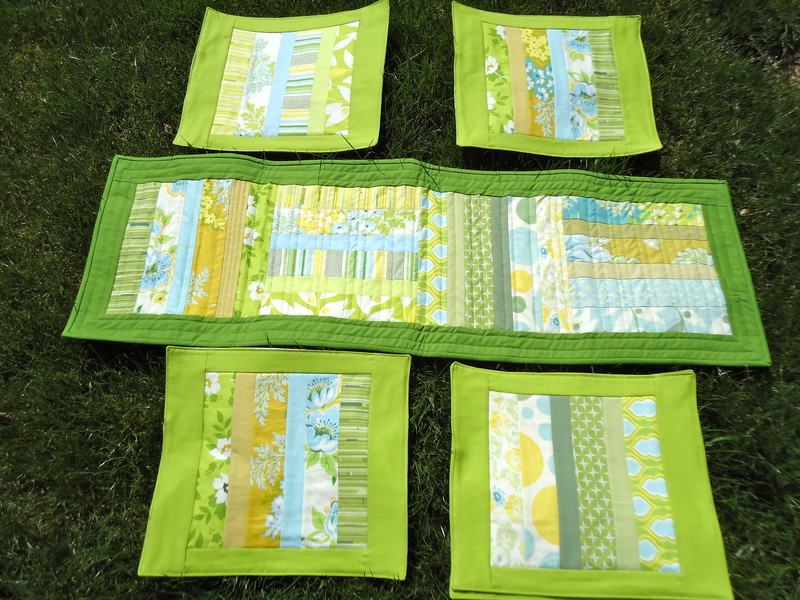 For the tablerunner, I alternated the layout of four of those 10.5-inch patchwork squares, and framed it with a grass green solid fabric. I especially love the look of those randomly quilted lines, especially on that backing fabric. 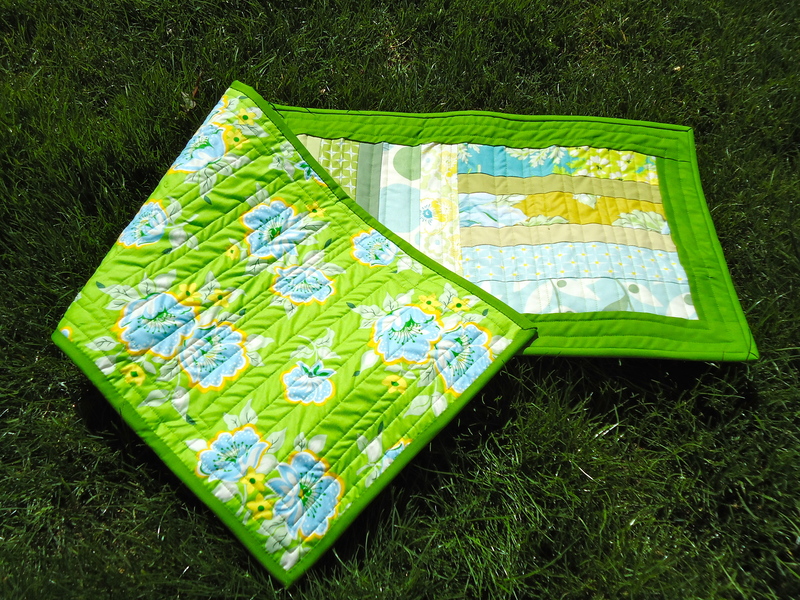 I used that same grass green solid fabric for the binding. It’s so cheerful and festive to sit down to such a bright lemony-lime table. What a nice way to start a dreary rainy morning! 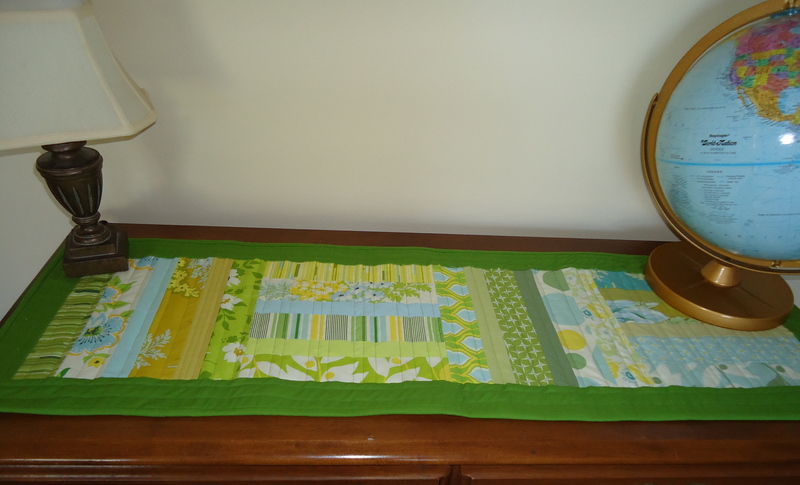 I love both sides of that table runner and the grass green sure does celebrate the best of Summer! In order to have the green, we must have the rain, right? Can you tell I’m already missing the bright sun?!! Oh, well, stuck inside quilting is not so bad. Have a great week-end, no matter what you do!! Sooo Pretty. I bet these look gorgeous on your table! oooh, you just can’t go wrong with these fabrics, they are so cheerful. these willmake for a lovely table! Wooo Terri – they all look fantastic – so bright and cheerful and the perfect colours for spring! And once again, we share similar taste in fabric — the Nicey Jane and the solids. Isn’t grass green wonderful? Terri, these are beautiful! I love lime, it’s so fresh and springy~! You’ll have to hit Farmer’s Market for some flowers! Have a good weekend, my friend! We’re putting in our garden! I LOOOVE Nicey Jane! The fabric is so soft and the prints are just adorable. I love looking at your table runners. I REALLY need to start making them-such a pretty and easy way to change the decor and add color. Beautiful, Terri! That color of green is so great for spring. These are very pretty! I have just baked some lemon lime syrup cakes – they would look perfect on your table! Your new runner and mats are full of citrusy goodness. 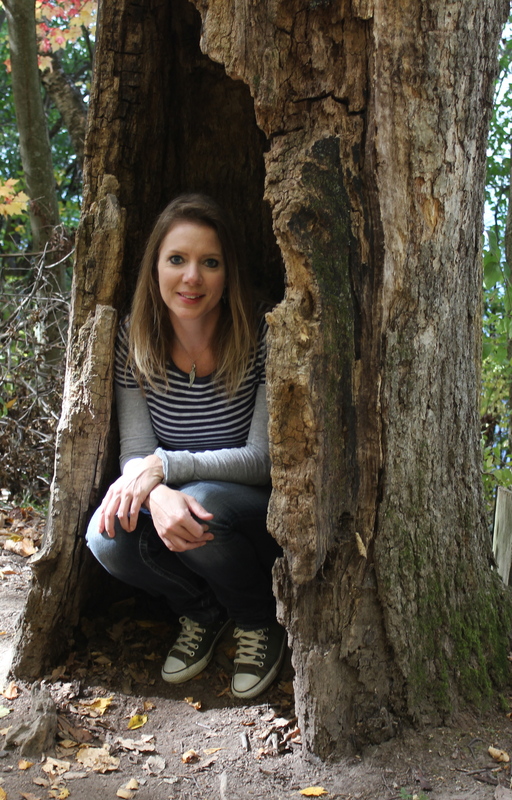 Just following up, i sent you a couple emails and haven’t heard anything… for june, are you still in? shoot me an email… Otherwise I need to fill your spot..thanks, I appreciate it. Love the bright spring goodness, ready for a picnic! I love your bright lime green table runner and placements. Such pretty fabrics. I don’t make very many table runners because I don’t like binding them. Hey terri, just checking back, since you got this, did you get the two emails i sent back today? send me your cell number too. thanks! Oh I hope this moving finishes soon. I can’t wait to get sewing again. This has got to be the longest I’ve been away from my machine, except when we moved from over seas to the states. I love those fabrics. They are really springy. They made my day just looking at them. I was just looking at some Nicey Jane this morning. It’s so bright and pretty! I really like your table decor. I need a new table runner and never thought to use this line for it…but now that I’ve seen it, I love it. Nice job! your table runner is beautiful! i love the colors.